Comments: The Terrell House at 732 Valley Street in Scottsville was owned by Charles L. Terrell, an African-American blacksmith from the 1870s to 1920s. Recently restored, the Terrell house was part of a community of African-American workers and business owners after the Civil War. A spring was located in the next lot and used by the community. Terrell purchased this house and a nearby blacksmith shop in 1889; this blacksmith shop was a brick structure and fronted on Valley Street. Terrell purchased a second blacksmith shop in an adjoining lot in 1896 to expand his existing business. 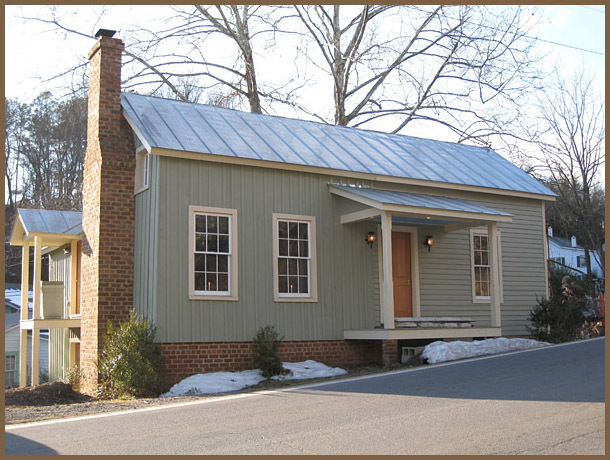 According to 1900 U.S. Federal Census of Albemarle County, Charles had two sons, William and Charles, who also were blacksmiths in the family business. Charles L. Terrell was born in 1859 in Virginia, the son of Nelson and Patsy Terrell, and died in 1928 in Scottsville, VA. Charles married Martha Jane (last name unknown), and they were the parents of William E. Terrell (b. May 1886, VA), Carry V. Terrell (b. January 1888, VA), Charles L. Terrell (b. November 1889, VA), Mary L. Terrell (b. June 1891, VA), Prentiss Terrell (b. December 1895, VA), Myrtle S. Terrell (b. December 1896, VA), James T. Terrell (b. November 1898, VA), Ethel E. Terrell (b. 1903, VA), and Dorothy Terrell (b. 1912, VA). The above 2010 photo is from the Connie Geary Collection at Scottsville Museum. References: 1880 U.S. Census, Scottsville, Albemarle Co., VA; 1900 U.S. Census, Scottsville Township, Albemarle Co., VA; 1910 U.S. Census, Scottsville Magisterial District, Albemarle Co., VA; 1920 U.S. Census, Scottsville Magisterial District, Albemarle Co., VA; Terrell Family, http://albemarle.wordpress.com/ .